The W.D. McKeehan Scholarship Fund was established by the national board of directors in 1983 as a tribute to W.D. “Mac” McKeehan and his long years or service and numerous contributions to the Guild as national registrar and national treasurer. This fund provides scholarship assistance to qualified individuals for participation in Handbell Musicians of America’s National Seminar. Deadlines and application materials are posted when scholarships are available for an upcoming event. The William H. Griffin Scholarship Fund was established in 2003 to honor Bill Griffin and his contributions to handbell music and to Handbell Musicians of America, particularly for his service as interim executive director during that time. This fund provides assistance to qualified individuals for participation in the annual Distinctly Bronze event. Deadlines and application materials will be posted when scholarships are available for an upcoming event. The D. Linda McKechnie Scholarship Fund was established in 2004. The purpose of the fund is to provide assistance to individuals and programs that promote education in elementary schools or to special needs populations. The assistance may be in the form of a scholarship to National Seminar for an individual working in one of these areas or in the form of a grant supporting programming in one of these areas. Deadlines and application materials will be posted when scholarships are available for an upcoming event. The Marilyn Kielniarz Memorial Scholarship Fund was established by the national board of directors in memory of and to honor Marilyn Kielniarz, who was in the midst of her term as president-elect when she was lost to cancer. Contributions to this fund will be used to award a memorial scholarship to a music educator for National Seminar. Deadlines and application materials will be posted when scholarships are available for an upcoming event. Created in August, 2010, to honor and memorialize long-time member and National Seminar event chair, Deborah Heine. Contributions to this fund will support scholarships for young ringers to attend national events. 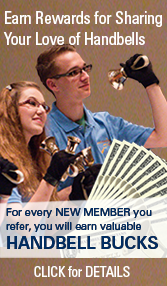 The Anonymous Education Scholarship Fund was established by an anonymous donor as a challenge to other Handbell Musicians of America members to contribute and support handbells in education and Guild educational events. 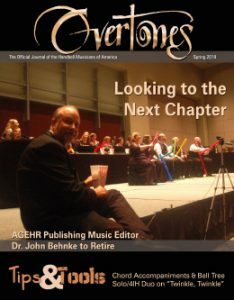 Contributions will be used to offer scholarships to Handbell Musicians of America events and grants to programs that promote handbells in educational settings. Please contact the Executive Director for more information about grants and scholarships available from this fund.